The BGR70 truss is designed to create large spans that can hold heavy loads. Compared to conventional 100’er truss systems, the BGR70 truss is 40% stronger and safes up to 35% transport volume. Rectangular profiles create a truss that can be used for spans up to 45 metres, still allowing a centre point load of 750 kg. 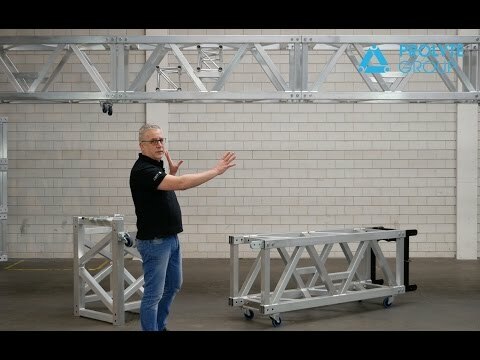 Using the unique pre-camber options, you can create an absolute straight truss. Depending on the applied load, a combination of spacers ranging from 0mm to 4mm can create a pre-camber effect that will result in zero deflection, despite the applied loading. This is a great feature when using motion or led screens. Zero deflection, due to pre-camber system. Ideal for motion or LED applications. Strong and compact – loads up to 3300kg on a 20m span. Designed in compliance with Eurocodes, manufactured following EN1090 standards.